Heather Dugmore: The co-founders of Handspring won recognition for their life-long dedication. Read here what Basil Jones and Adrian Kohler say about the arts in SA. Ideas about our humaneness, our animality and what ‘becoming human’ means are being debated vigorously in humanities research and closely relate to what we are doing in puppetry,” says Basil Jones, co-founder and executive producer of the Handspring Puppet Company. Jones and the company’s co-founder and artistic director, Adrian Kohler, are the recipients of the Arts & Culture Trust’s Visual Arts Lifetime Achievement Award, sponsored by Nedbank Arts Affinity. They received their award alongside four other Lifetime Achievement Award recipients at the 20th Arts & Culture Trust Awards at Sun International’s Maslow Hotel in Sandton earlier in November. The Cape Town-based Handspring Puppet Company, or “Handspring” as it is called, was founded by Jones and Kohler in 1981 and for the past 36 years, it has been an artistic wellspring for performers, designers, theatre artists and technicians. Their work has been presented in more than 30 countries worldwide. It includes the renowned theatre production of War Horse, for which they created full-scale horses galloping on stage, with flanks, hides and sinews, built of steel, leather and aircraft cables. Jones and Kohler collaborate with a wide range of artists including William Kentridge, the Sogolon Puppet Troupe from Mali and Koffi Koko from Benin. Their puppetry and theatre extends from world stages to rural areas including the Little Karoo community of Barrydale. In partnership with children-focused nongovernmental organisation Net Vir Pret and the Centre for Humanities Research at the University of the Western Cape, the company produces the Barrydale Day of Reconciliation Parade and Performance. The event is an annual parade at which more than 200 local pupils, young people and performers are part of the production, including 120 children making and performing with their own puppets. 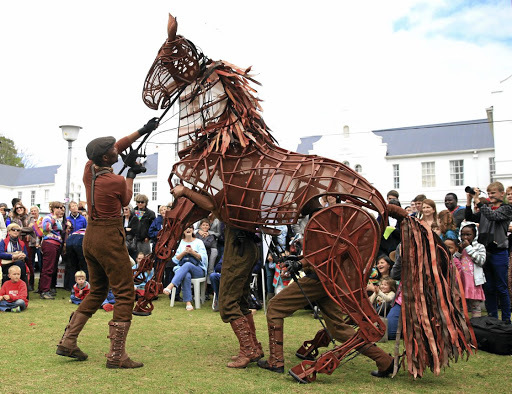 The parade and performance featuring magnificent, life-size animal puppets explore reconciliation, humanity and its place in the natural environment. Jones and Kohler answered important questions about the arts in SA. Where do you think the arts in SA are at now? The gallery-based visual arts are generally riding high. They are supported by a wealthy elite that is happy to buy work that engages a vast range of ideas. Many of our artists are profiled and celebrated in art fairs and biennales all over the world. In Basel, Shanghai, Miami, Sao Paulo, Santa Fe or London, South African artists meet and exchange ideas with successful artists from many other African countries, who are doing equally interesting and challenging work. In comparison, the performing arts are lagging. There is much less money for a much more expensive art form. And (compared with the fine arts) the range of themes tackled is narrower. There are notable exceptions, such as Kentridge’s Centre for the Less Good Idea, which produced the sublime Requiem by Gregory Maqoma in 2016. Theatre and dance are by their nature more collaborative and cost more to produce than works by a solo visual artist. There are rehearsals, actors, dancers, directors, lighting designers, musicians and/or musical recording, video design, stage management, company management, set builders, costume design and making, advertising and printing. And if the resulting production can’t tour, there is normally only a three-to five-week season during which they can recoup their investment. A touring circuit of provincial theatres with appropriate lighting and sound technology as well as security is needed, something similar perhaps to Onda (www.onda.fr/en), which serves French provincial theatres so well. Failing that, we need to do professional video recordings of performances to bring live theatre and dance to movie houses and communities all over SA and worldwide, as is done by the New York Met to give their operas global exposure. What are you excited by in your field at present? I am most excited by the Centre for Humanities Research. At the centre, ideas about our humaneness and animality and what “becoming” human means are being vigorously debated — ideas that relate closely to what we are doing in puppetry. This is a place where you’ll meet and engage with intellectually challenging scholars from SA and other parts of Africa and the global South including India and Argentina. The Centre for Humanities Research is birthing the most exciting phenomenon in puppetry circles for a long time: the Andrew W Mellon Foundation-funded Laboratory of Kinetic Objects and Puppetry Arts, which will be run out of a wonderful colonnaded building in Salt River. Its postgraduate programme is attracting and exciting a range of exciting young theatre practitioners from here and abroad. What would you like see happening in visual arts sponsorship to advance its recognition and support? The vital growth of SA’s creative economy requires corporates to collaborate across the broad spectrum of the arts. There is room for every brand to earn their turn in the spotlight. But the corporates should be aware that arts sponsorship is not a branding exercise. It is far beyond that. Our arts and artists are the custodians of our nation’s spiritual survival. The mutual co-operation of corporates and their sponsorship programmes is vital in the promotion of this goal. The Barrydale Parade and Performance is a superb example of a successful rural community production. What makes it successful? We have been involved in community theatre initiatives for many years and made mistakes but our understanding of what it takes has grown. The Barrydale Parade, which has grown over more than a decade, (the past seven years with Handspring’s participation) is a good example and has also shown that puppet theatre can play a significant role in assisting communities to publicly articulate their thoughts and visions for a different future. The success of a community arts initiative depends on the interconnectedness of a variety of essential nodes. Each node (which, by definition, can range from a person to a building) needs to have stability, strength and leadership. Buildings are needed for meetings, rehearsals and productions. They must be well run, with functioning toilets and good security. On the people side, successful, enduring productions need directors and producers with artistic expertise, experience and confidence to serve the play. People from outside the community including artists and musicians, need accommodation. Vehicles are vital to move people between the rural areas and the city and to give the young people from the community who are part of the production the opportunity to experience theatre in the city, such as the Baxter, Artscape and Magnet Theatre in Cape Town, and to meet and talk to the performers, directors, producers and backstage teams. Volunteers, local and international, must be managed well and made to feel welcome and useful. Sound and lighting specialists have to be persuaded to hire their equipment for far less than normal. The police need to feel they are friends of the production and have a clear role on the night. Any sustainable community production is about strengthening these networks over time and helping people to understand that networks are not just made up of people; they are also made up of inanimate things: cars, computers, phones, expertise, experience, diversity, multinationality. A network needs years to grow and it needs support and funding in various ways. It also needs the corporates who choose to support a production, organisation or community, to draw on their networks to grow it from strength to strength. That’s how you grow successful, enduring artistic initiatives in rural communities that contribute to the communities’ artistic, psychological and economic wellbeing. What helped the Handspring Puppet Company get going in the beginning and what keeps you going and growing stronger and more exceptional year on year? In the early years, we were inspired by the pit-of-the-stomach knowledge that our art form, puppet theatre, was underestimated and misunderstood. Just prior to starting Handspring, we had discovered the puppetry traditions of Mali in West Africa. We realised that with some imagination, we might be able to develop a contemporary form of puppetry in SA that was as closely connected to the life of the people of the country as is the Malian tradition. Now, 36 years into our career, we are propelled by a growing understanding of the power and metaphysical importance of the life of prosthetic objects in performance, be it a person or an animal. These “prostheses”, if designed well and manipulated with artistry, can become vehicles to express our thoughts and dreams in a way that no other medium can, because they (being dead but struggling to live) embody our most urgent human need: life. Working with William Kentridge as artist and Jane Taylor as intellectual mentor. Their creative rigour has informed our work for 20 years. What keeps you in the country? The geography of collaborations between Premesh Lalu of the Centre for Humanities Research; Jane Taylor of the Laboratory of Kinetic Objects; the Ukwanda Puppetry and Design Collective; and our puppetry colleagues who are spread across the world. They inspire as well as provoke us. What advice do you have for young artists or visual artists in the country? Be politically and ecologically courageous. Drive yourself hard. Don’t be anti-intellectual. Read books and engage viscerally with people working in other disciplines: science, psychology, philosophy, sport as well as architecture. What would you create if you were given complete freedom without any budgetary constraints? A professional production, centred on the lives and characters of a herd of life-size (puppet) elephants, which tackle issues of land ownership in SA. A play that could tour in Africa and other continents and bring to life the opinions and feelings of all people about land and what land means.